Classic retro style candy heart button badge. 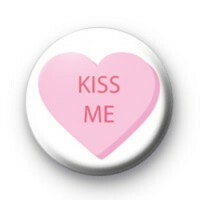 This fun old school Valentine's Badge has a pink candy love heart and the words, Kiss Me. It is fun and romantic and would be a sweet badge to pin to the front your a Valentine's Day card or if you're feeling sassy you could pin it to your jumper/coat and see what happens.